Did you think I had forgotten about my promise to tell the story of keet #3? Remember my post last week about his 2 days worth of pipping? 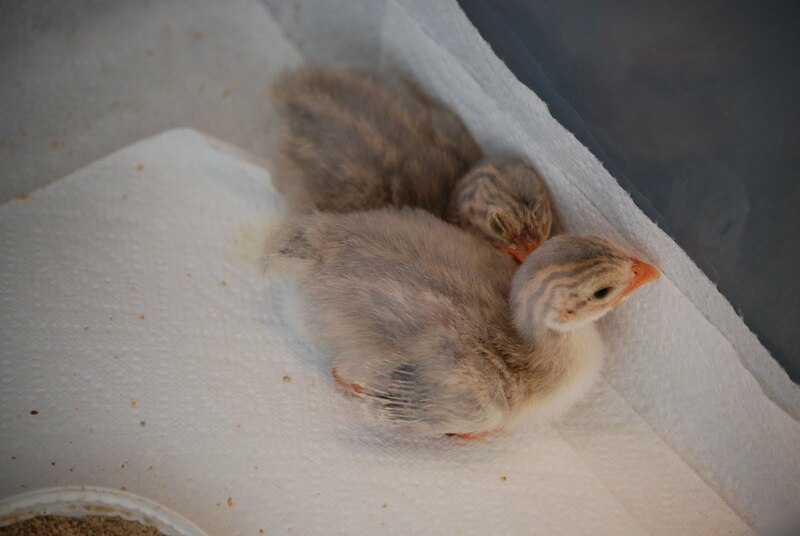 I had vowed, yea SWORE, I would not help any keets hatch. Every single bird authority in the vast sea of internet information said "if they cannot hatch on their own, then they are weak or have some deformity and will not survive anyway." The overwhelming response was YES and DO IT NOW OR HE'S GOING TO DIE!! 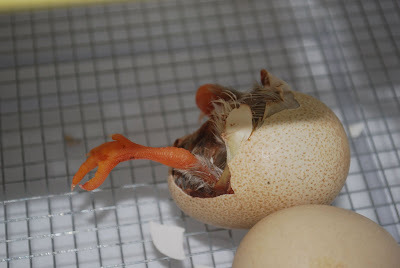 One gal even gave me a link that was rich with information on helping a guinea keet hatch. I assembled the necessary tools-- small nail scissors, tweezers, cotton balls, q-tips, bowl of warm water, wet & warm washcloth. Oh yes, and my eyeglass readers too, so I could see what the heck I was doing! 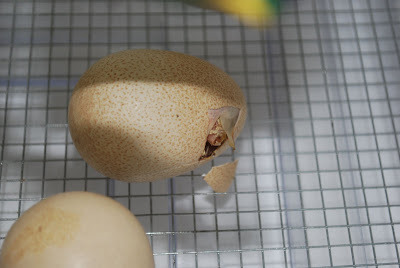 As I picked up the egg and removed it from the incubator, I could feel the small keet move inside. I sat down at my computer desk, enveloped the egg in the warm, damp washcloth, and began to chip away at his shell with the tweezers. I feared I would hurt the keet! I was very, very cautious at first-- almost too timid. 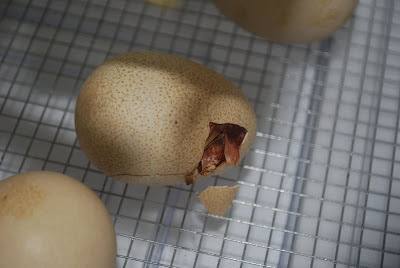 I used the nail scissors and the tweezers interchangeably, trying to create a crack in the shell with the scissors and then pull it away with the tweezers. 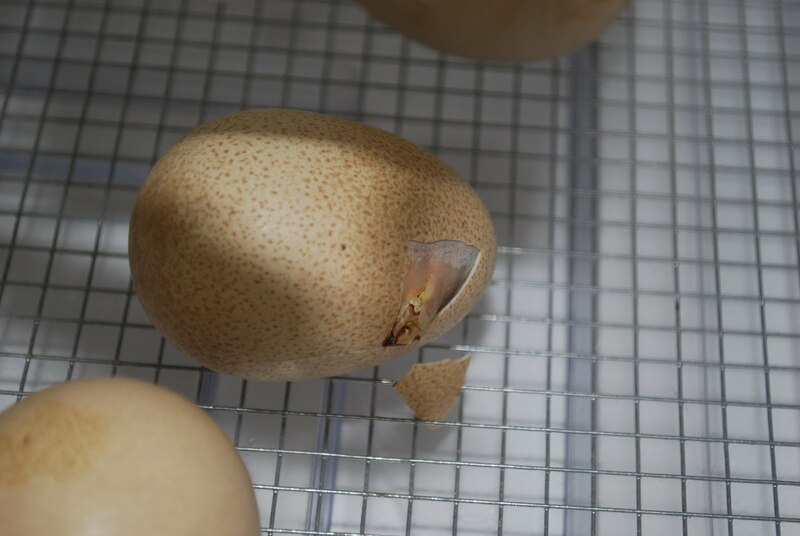 I wet the edges of the shell and the dry membrane with a q-tip dipped in warm water, and gently pulled at the membrane, careful not to pull any of the keet with it. 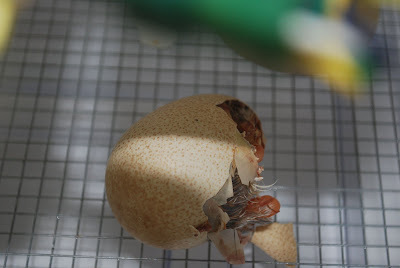 Once I had made his hole larger, I put him back in the incubator (huge sigh of relief!) and waited for him to finish the job. I returned in 15 minutes expecting to see a hatched keet... um, no. In fact, it appeared he needed MORE assistance from me. ... this time, as I helped him one of his little eyes popped open. I wonder what he thought! I just LOVE this leg photo! I returned again to find he was STILL not out of his shell! Ok, this time we removed enough shell so that only half remained. My hands did not shake as much ... I was getting used to the procedure. Let's put you back in the incubator one more time. In fact, let's tilt the egg so you, well, sort of FALL OUT. Yay!! 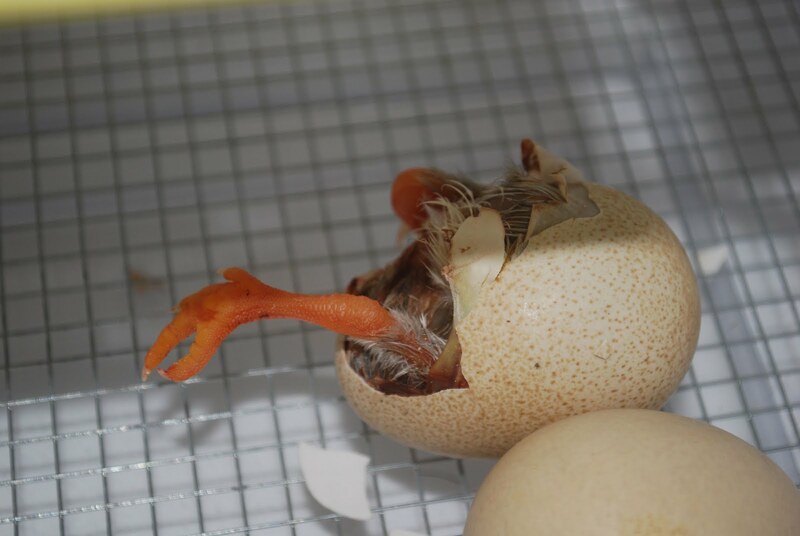 He finally "hatched"! A REALLY BIG SIGH OF RELIEF. Today marks his one week birthday. He's a fine, healthy keet, and growing as fast as his sibling. I'm so glad I took the chance to help him out. What lesson did I learn from this experience? And I realized, in that moment, the answer to that question was the same answer to "What will happen if I do NOTHING?" All of us step out of comfort zones at one time or another. Living in the country is helping me do this more and more. was really, really happy that you did so? It's been awhile since I stepped out of my comfort zone. So long in fact, I don't remember what it was. 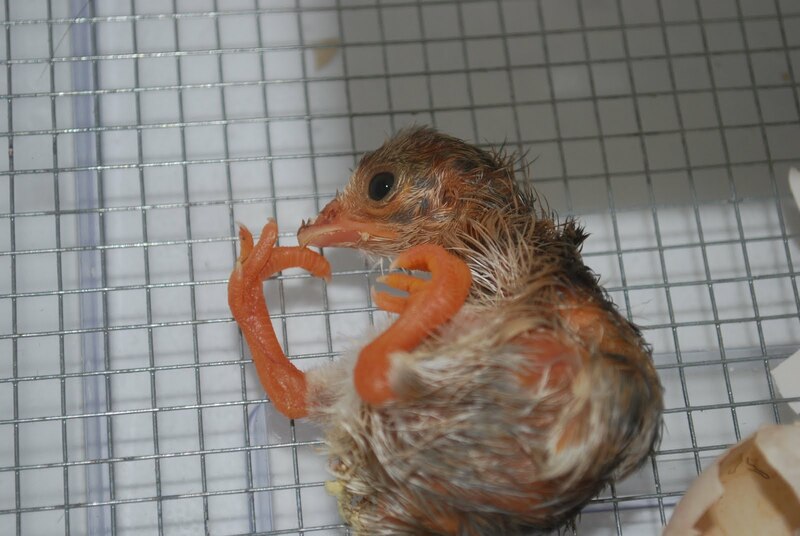 Congrats on delivering your first keet. A job well done indeed. Oh my gosh, you were awesome! Great job! I'm familiar with the shaking hand thing, that rush of adrenaline that you have no control over. Though some deep cleansing breaths do help a little. I think the last time I had an emergency like that was a few years back when my neighbor's dog jumped over the fence - with a chain around his neck attached to his doghouse. The time it took me to jump the fence and get to him was forever, and I didn't know how long he'd been hanging. Actually, I had to jump two fences, mine and another neighbor's fence he'd jumped over. Luckily his collar wasn't overly tight, and he was able to hold his weight somewhat on the fence itself to keep from choking. But then all 115#s of me had to lift this 50plus # dog up enough to push him back into his yard, then move his igloo away from the fence, etc. Whew! Congratulations on a job well done! You saved a life! I would have been shaking too. And scared. Terrific story with a happy ending...yay! Hats off to you for following your heart. 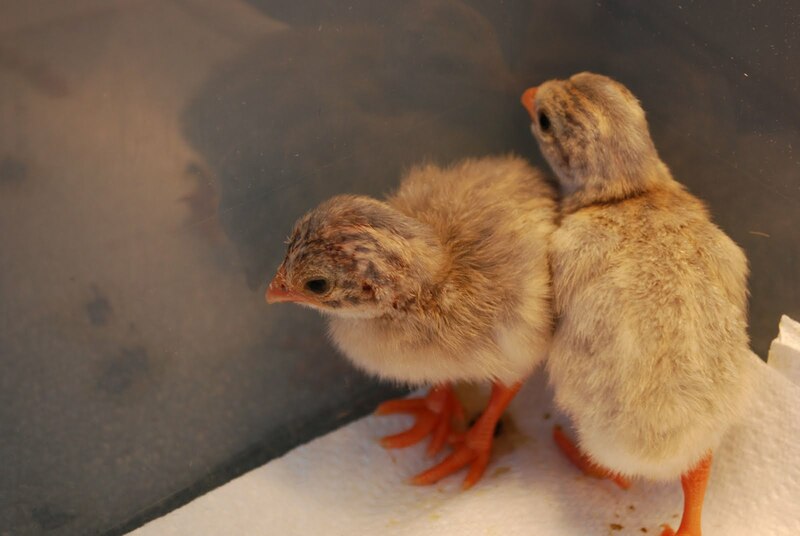 Now you can be one of those someone else will turn to when looking for the "how-to's" of hatching a keet. When did I last step out of my comfort zone...hmmm, the day the chicks came home. I was thrilled, but terrified too! I was so sure I'd goof up, that the kids and I slept right next to them the first week. I was up every couple of hours checking to see if they were okay! I am so glad you helped the poor little keet out. When you told us last week that the advice was NOT to help any of them I was, frankly, very upset. I understand the principle, but after a day or 2 of them trying I definitely believe in helping. Way to go, Momma Keet! You definitely saved him. What a great story. I'm so glad you pursued aiding that beautiful animal. Comfort zone. HMMMM. Not certain what that is anymore. This is so amazing. I'm glad you have the pictures to go with the story. You stepping out of your comfort zone sure created a happy moment. I'm not sure when the last time I stepped out of my comfort zone but I must step outside of it soon.